Last week, I shared a brief history of wine in Southern California. 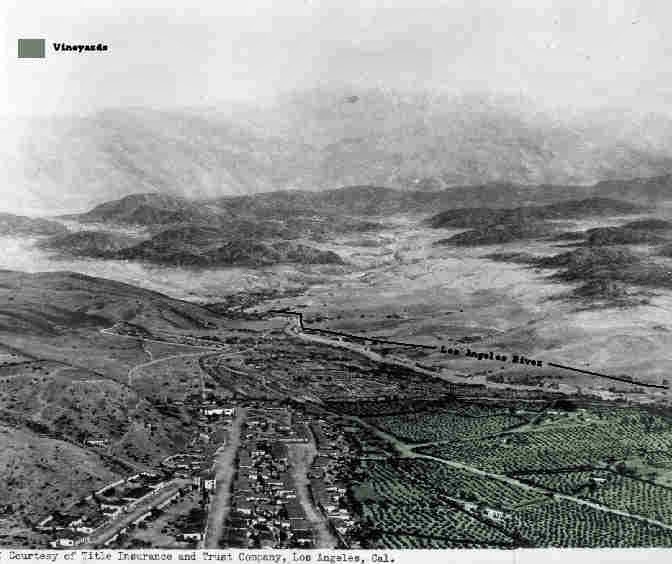 Los Angeles and San Gabriel may have been where things started, but as the population expanded, the outlying areas of the Cucamonga Valley were where the largest, and most successful vineyards were grown. When I left off last week, we were at the time of prohibition, but I want to take a step back a bit…. I had the opportunity to go wine tasting at the GalleanoWinery in Mira Loma. While tasting some of their wines, in walks Don Galleano, third generation winemaker. Next thing I know, we are going on a private tour of the property, and winery, and learning the amazing history of this property. Don Galleano told us that the property was originally owned by Colonel Cantu (the first territorial governor of Baja California). In the 1920, due to political changes in Mexico, Col. Cantu moved to California, and purchased a ranch in Wineville (now Mira Loma). The house that still stands on the property is the original house, but now with a wine cellar, and a different front door (as the original door faced north, accepting all the winds and dust that flow through the Cajon Pass). In 1927, Don’s grandfather, Domenico purchased the ranch from Cantu. Domenico had moved from his homeland in Italy in 1913, spending time as a farm owner in what is now Ontario. 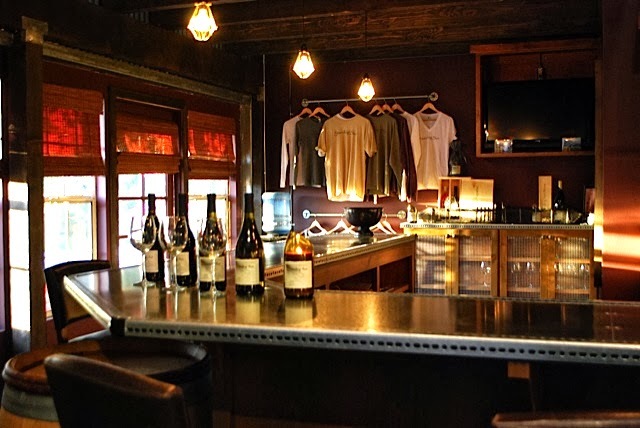 Wine was made in the newly remodeled ranch house cellar, and grapes were grown on the 160 acre ranch. Note that this was all going on during Prohibition. Domenico produced sacramental wine, but mainly sold grapes for home winemakers (who were allowed under the 18 amendment to make wine for personal use). After Prohibition, Domenico and his son (Don’s father), Bernard “Nino” opened their winery for commercial business. In the late 1940’s, the winery had outgrown itself, and they build a new winery building and tasting room, which is what you see today. Today, Galleano is one of the few wineries that still makes a traditional Angelica, made with Mission grapes and brandy. The Mission grapes and Palomino (used to make their sherry-style wines) are grown on the property. Zinfandel is the other major grape in their wine selection. Don took us through the winery. Here, he showed us the large concrete fermentation tanks, and the impressive redwood fermentation tanks. These old tanks look to be original to the winery. Along the back of the winery are more modern stainless steel tanks. Here, we “barrel tasted” two different vintages of Zinfandel. These Zinfandels are deep in color, and fruity, with a hint of menthol. I must say, their dessert wines are worth the trip to the winery alone, but finding Mission grapes, and Cucamonga Valley Zinfandel is an added bonus. Galleano is currently the largest shipper of grapes in Southern California. After spending the time with Don Galleano, we were inspired to check out another of the remaining wineries in Cucamonga Valley: Joseph Fillippi. Joseph Fillippi winery is located just north of the Victoria Gardens Shopping Center, which was once home to Ellena Brothers-Regina vineyards. Their tasting room houses a large Cucamonga Valley wine museum, with bottles, labels, and photos of the area. Their wine list consists of a large array of reds, whites, and dessert wines. J.P and Gino Fillipi oversee 45 total acres, including old vines planted in 1922 by their grandfather, Giovanni Filippi. The largest remaining vineyard parcel (15 acres) is the Hippard Ranch Vineyard, located at Victoria and Etiwanda, in Rancho Cucamonga. In the 1960s, the Filippi family added the site of California's oldest winery, Cucamonga Rancho (travel video), to their assets. Cucamonga Rancho was granted to Tiburico Tapis, by the Mexican Governor of Alta California, in 1838. Tapia constructed an adobe home on Red Hill and raised cattle. He also began a successful winery, portions of which stand today, known as the Thomas Winery. The Thomas Winery was in production through the mid-1960′s and became a popular destination for travelers along Route 66. 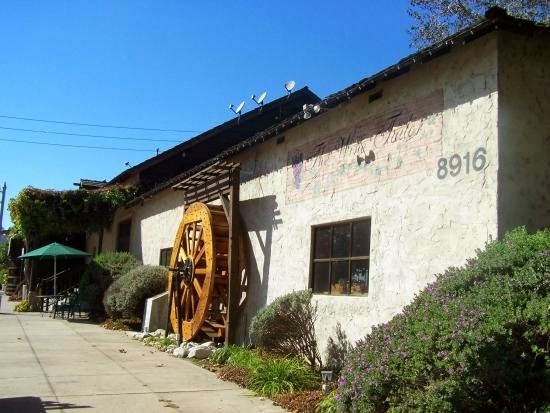 The Thomas Winery building is a California Historic Landmark (#490), designated as the oldest commercial winery in California. 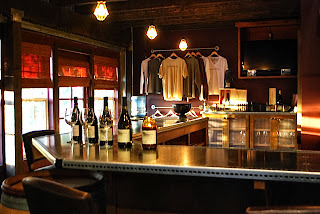 The “Wine Tailor” was opened in this location in 2004 as a custom winemaking franchise. In 1995, it was Gino Filippi, who successfully established the Cucamonga Valley AVA with the U.S . Department of Treasury. In the 1940’s there were over 60 wineries and 35,000 acres of vineyard. Today, only about 800 acres, and the three remaining Cucamonga Valley wineries: Galleano, Joseph Filippi, and Rancho de Philo. You really need to visit these wineries, as urbanization continues to spread, and the value of land goes up, the remaining vineyards will disappear, and the wine industry will cease. Our wine heritage is disappearing. Southern California wineries have also moved south to the Temecula area. I’ll take a look at this area in an upcoming blog. When anyone mentions “California wine” thoughts immediately wander to the northern part of the state: Napa, Sonoma, or even the Central Coast. But, this is not where the California wine story starts. 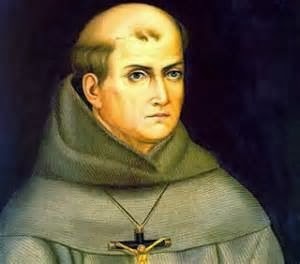 It all began with a Franciscan monk by the name of Junipero Serra, with the planting of Mission grapes at the San Diego mission in 1769. However, the first written record of grapes grown, in what was to become California, occurred in 1781 at the mission in San Juan Capistrano. As the string of missions spread from Baja California into Alta California, the Mission at San Gabriel established itself as the largest (170 acres) and most prosperous within the mission system. The Mission grape is an import from Spain. The Spanish Franciscan priests probably brought the grape to Mexico in the early to mid 1500’s. 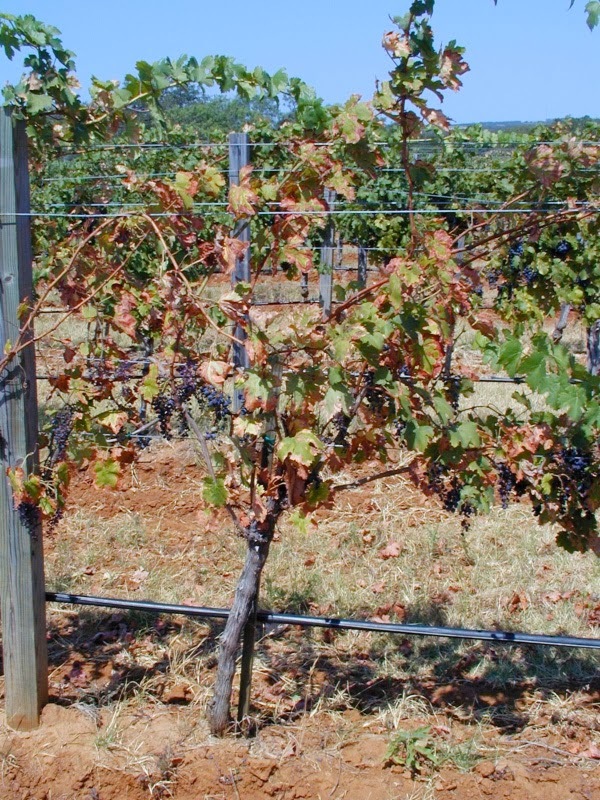 It is thought that the Mission grape, also known as Criolla, El Paso, and Pais was the first Vitis Vinfera variety to be introduced to the New World. Based on historical accounts, the wines of the missions were typically sweet, which might make sense, since the Mission grape doesn’t really make good still wine. It is a vigorous variety which contains high sugar levels, but low acid. The grapes also tended to raisinate in the warm weather of Southern California. Only a few wineries still make the traditional wine known as Angelica. Angelica is made from the mission grape, and most likely named after the city of Los Angeles. The traditional style is actually fortified grape juice, rather than a fermented wine. These are known as “mistelle”, and are closer to cordials than wine. The process involves adding a high alcohol brandy to unfermented grape juice, in order to arrest any fermentation, and preserve the sugar levels. Up until the 1820’s most vineyards were owned by Mexicans. The first recorded American grower in Southern California was Joseph Chapman. In 1826, he planted 4,000 vines in Los Angeles (which was then a small group of pueblos along the Los Angeles River, with a population of less than 2,000). By the 1830’s Jean Louis Vignes (a Frenchman) planted 35 acres, just east of Los Angeles, including the first recorded plantings of European vines in California. 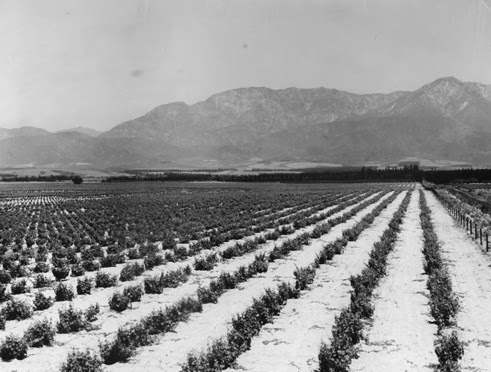 Vignes was later challenged by the vineyards of William Wolfskill (from Kentucky), who developed a 100 acre vineyard just southeast of Los Angeles. By the late 1830’s vineyards had been established east of Los Angeles in San Bernardino, Cucamonga, Guasti, and Rancho Jurupa (now known as Riverside). Of course, the San Gabriel Valley (home of the San Gabriel Mission) continued to prosper, particularly when Benjamin Wilson expanded his land holdings at Santa Anita Rancho. While grapes had been planted in Northern California prior to the Gold Rush (1849), the south produced much more wine, and exported the bulk of it to San Francisco. It wasn’t until about 1856 that vineyard plantings started booming in the north, to meet demand for growing population. Meanwhile, back in Southern California the vineyards continued to expand. The community of Anaheim (home of Disneyland) grew out of a plan to recruit disenchanted Germans from the northern gold mining operations. By 1882 there were 50 wineries in Anaheim, but by 1885, a disease passing through the vineyards had eliminated half of the vines. This disease was referred to as “Anaheim Disease” (better known today as Pierce’s Disease, and is still a problem in the Temecula area – and no known cure). By 1891, there were only 14 acres of vines left in Anaheim, the rest being replaced by oranges and walnuts. 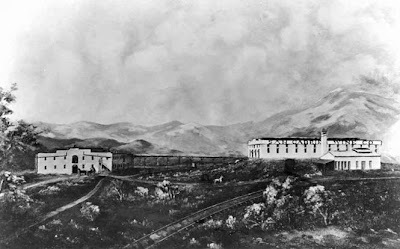 San Gabriel Wine Company in the 1880s. Image courtesy of City of Alhambra. Around the same time as Anaheim’s growth, the San Gabriel Valley continued to expand. The San Gabriel Wine Company opened in 1882. One of the owners (James De Barth Shorb) built a large vineyard house, named “San Marino” which would later become the site of the Huntington Art Gallery. The current site leaves little indication that it was once surrounded by vineyards. Shorb built his winery in the new town of “Alhambra”. In 1885, this winery was the largest winery in the world. Timing was right for the California wine industry to expand, as European vines were being devastated by phylloxera. By 1890, the San Gabriel Valley vineyards were being hit hard by the same disease that terminated the grape growing in Anaheim. 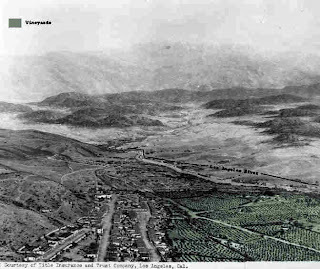 And, by 1896, the San Gabriel Wine Company had gone out of business, many of its vineyards replaced with orange groves. The decline of wine production in Southern California, in the late 19th century, was pretty rapid, due to the incurable Pierce’s Disease, and the rapid expansion of wineries in the northern part of the state. Vineyards in the south were replanted with more resilient orange groves. The exception was due east of the San Gabriel Valley, known as the Cucamonga Valley (where Riverside and San Bernardino overlap). The soils in this area are an alluvial soil, with lots of sand…a type of soil that is more pest resistant, and hard to grow anything in (but just right for grape vines). It is here, that Secundo Guasti planted over 6,000 acres of vines, and created the “world’s largest vineyard” in the early 1900’s. These vineyards lasted until the expansion of housing tracts in the 1970’s and 1980’s, when the value of the land for homes was worth more than the value of vineyards. Today, less than 800 acres remain in the entire Cucamonga Valley. However, a rich wine culture had been established, and continues today with three founding families continuing to farm some of their original vineyards. Remnants of the old vineyards still have locations that exist today. Many people drive by the intersection of the 210 and 15 freeways. On the north east side of this intersection there is, what looks like, an abandoned head-trained vineyard. 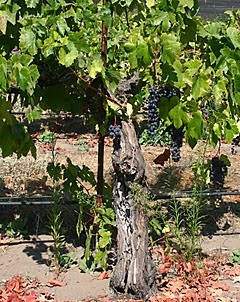 These are old vine Zinfandel (planted between 1880 and 1910), tended by the Lopez Ranch. They are dry farmed – no irrigation and left to grow as they will. They are low production vines, but what they do produce is unique to Southern California, with intense aromas and flavors. On the south east corner of this intersection, sits a 12 acre parcel of Palomino grapes (the primary grape used in the production of Sherry). From then to now, the area is known for its’ Zinfandel, Sherry-style and Port-style wines. By 1919, another “pest” injured the already struggling wine industry…the Eighteenth Amendment to the Constitution. 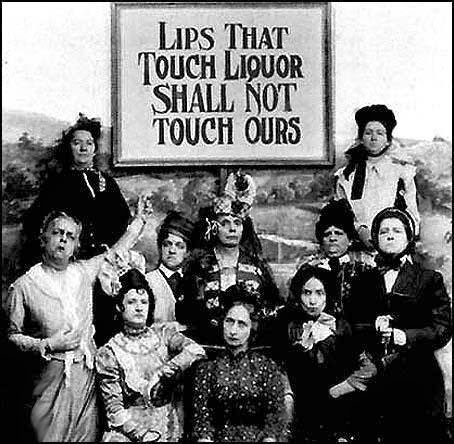 Prohibition (the forbidding of all trade in alcoholic beverages) went into effect in 1920. The only wineries that were able to survive, produced sacramental wine, unfermented grape juice, and sold the zinfandel grapes (which were favorites of home winemakers) who were permitted to make up to 200 gallons of wine for ”personal use”. The amendment was repealed in December 1933. But, after 13 years, the damage had been done. In next week’s blog, I’ll follow up with my visits at two of the three remaining wineries in Cucamonga Valley, including time spent with Don Galleano. * For much more detailed information on the wine history of California, I encourage you to read "A History of Wine in America Volume 1 and 2" by Thomas Pinney. Where has the year gone? The weather has turned colder, the leaves are changing, and Christmas decorations are on sale at Costco. It must be time for Halloween! While most of us spend our time figuring out what to wear to the local costume party, or if we're hosting, how to decorate the house...the rest of us our trying to plan the food and beverages for the evening. 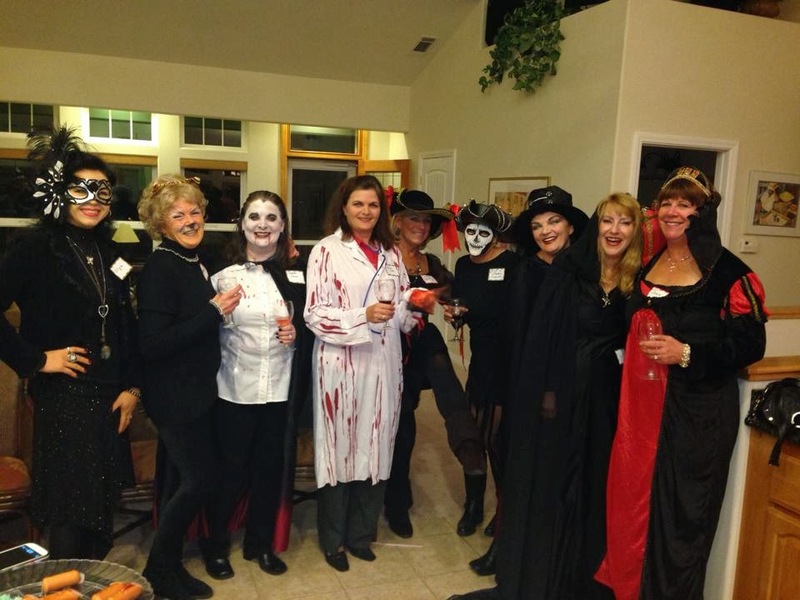 If it is an adult party, there are plenty of Halloween drinks that might suit the bill, but how about wine? What if you want to serve wine, and keep the Halloween theme? I have a few (maybe more) suggestions for you to try. I'll be the first to say, some of these wines are a bit difficult to find. I checked the local BevMo and Total Wine, as well as the local grocery store, with no luck. Where I did find a selection in stock was a bit surprising....World Market. Many of these Halloween wines are also available online, and with early enough notice, you should be able to order, and have them delivered prior to October 31st. Werewolf Wine - from Romania, and available through different online stores. Goose Bumps - a red wine from Sicily. A light fruity red. Found at World Market. Chateau Diana (makes Trick, Treat and Zombie Zin) - simple, but fun wines. 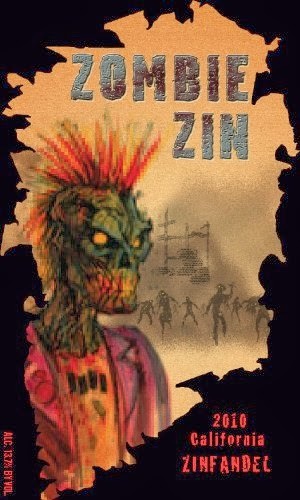 7 Deadly Zins - voted one of the favorite Zinfandels in our informal blind tasting. Also, there are some pretty good wines coming out of Romania...look for Transylvanian wine. 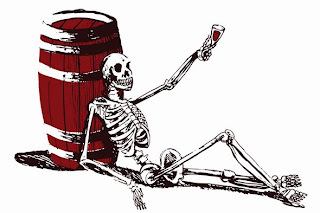 I'm sure there are more out there, and if you come across some good wines for Halloween, add them to the comments section below. Last week, I shared our adventures in the Central Coast. The first two days were spent with a large group, which really limits where you can go. When I organize these wine trips, I always leave Sunday and Monday for my “wish list” wineries to seek. This list grows, as I met winemakers, and ask for recommendations .Usually, my best “finds” are on Sundays and Mondays. This year was no exception. Sunday morning started with breakfast at Ellen’s Danish Pancake House in Buellton. I have found this place to be better than the more well-known places in Solvang, and less crowded. I have often run into winemakers in this place, and the prices are very reasonable. The previous day, I had been able to connect with Mike Roth, the winemaker at Martian Ranch and Vineyards, and was able to arrange a tasting with his assistant winemaker, Craig Winchester, on Sunday morning. We had heard about Martian from other winemakers, and just happened to have ordered a bottle of “Ground Control” for lunch on Friday. We drove towards Los Alamos, then turned off at Alisos Cyn Rd. The addresses weren't matching up, and we wondered where we were going, then we came across a little martian image along the right side of the road, headed up the dirt road, and there it was. We were the only ones there. While the name Martian brings images of little space creatures (and they do play this up on their label and in their tasting room), the name actually comes from a combination of the owner’s son’s names: Martin and Ian. All the wines are estate grown, and biodynamic. They also eliminate the use of added sulfur, which means they have to keep everything extraordinarily clean. We met with the Craig, and he showed us around the crush facility, and their beautiful wooden fermentation tanks, then into the cellar room for some barrel tastings. When we worked our way back out to the tasting room, we tried virtually every wine they make, including some new release Chenin Blanc, Albarino, and Cabernet Franc. All their wines are something special, and I would really keep an eye on these guys. Their wine club is currently just starting up, and as soon as word gets out that their wines are priced between $20 and $35….good luck finding this small production wine. This is your “hot tip” for the week! After spending three hours at Martian, we traveled north to the Arroyo Grande AVA. We drove through the quaint little town (I have to go back to check out the ice cream store), and arrived at Talley Vineyards. We pulled out the picnic coolers, and sat down for lunch as a classic rock band played tunes in the outdoor grass area. Talley is surrounded by farm land, mixed in with grapevines. Their main focus is on Pinot Noir and Chardonnay. Next we drove about fifteen minutes further north, into the Edna Valley AVA, and stopped at Sextant Wines, located in the original townsite of Edna. The wines are sourced locally, and from Paso Robles. The wines that stood out for me, were the two dessert wines. Sitting behind the tasting room building is the actual old Edna town site. It seems that most people don’t even realize it is there. By now, the day was mostly gone, so we headed back to our hotel, then off to dinner at Root 246. The restaurant is located in Solvang, and offers some of the most interesting seasonal cuisine in the area. While most everyone in our group ordered the prime rib special, I stuck with the menu. The appetizer of Lamb belly was followed by the finest pork dish I have ever had. The pork was sous vide, tender but crispy on the outside….absolutely delicious. Monday we started early, and drove over to Mosby. They produce a number of Italian varietals that many people are not familiar with: Sangrantino, Teroldego, Lagrein, and Dolcetto. These are great food wines, at reasonable prices. Our next stop was at Standing Sun wines. This winery was suggested by a number of other winemakers. When we arrived, we were greeted by the winemaker/owner, John Wright. He was in the process of rearranging his cellar, so he could host a concert there that evening. John told us that this was a regular happening in his winery, where musicians come in and play. His wine selection was a mix of Rhone and Burgundy varietals. On our way out of town, we stopped by the Los Olivos Grocery store. They have a large selection of local wines, cheeses, balsamic vinegar, olive oils, fresh bread, and specialty foods. Hopefully the last two blogs have given you some ideas for your next wine tasting trip in Santa Barbara County. There is a lot to explore, and some great spots that you should check out.